Pressure cookers have gone a long way. Gone are the days when you had to adjust & fix the whistle, monitor it to avoid overheating and burning of the foods and also burn the whole house by getting preoccupied with other things. From times now pressure cooker has seen a lot of variations in its features for better and safe cooking. Farberware is a well known cooker ware brand in the US. They have come up with “Save Energy” tagline associated with its new product called the “Electric Pressure Cooker”. Faberware Electric Pressure Cooker is complimented to have saved 70 percent of the energy while cooking. You get the liberty to decide at which temperature and time you wish your food to be cooked. The secret behind reduced cooking time is the uniform pressure at any temperature. You can either cook or pressure cook the food you want to prepare. This handsome pressure cooker comes with a highly polished stainless steel exterior with a programmable cooking possible. The control panel gives you the freedom of storing the food up to 2 hours after cooking. You also get the advantage of keeping the food at serving temperature with the “warm” function. On one hand where the exterior comes with a stay cool technology; there is a removable nonstick cooking pot also which can brown the foods before steaming. The electronic controls can also take the guesswork out of heat adjustments and cooking times. It is always a headache to trace the replacement parts in any cooker and many people fail to realize that they would require the replacement parts when the time comes. Place the food inside and secure the lid tightly. Select from the appropriate options given i.e. steam cooking, pressure cooking or browning foods. Cook the food for the requisite time without opening the lid. The programmable timer allows you to cook in your absence. Place the food and secure the lid before setting the timer. First set the programmable clock to the correct time and then set the cooking time. There is another option called the “delay time” which tells the m/c when to start. Then finally press the start button. A green light symbolizes ongoing cooking and a red light symbolizes complete cooking. Keep your face away from the pressure valve when the steam is getting released. Make sure you do not close the lid or open it while cooking. Never use the cooker without the pot in place. 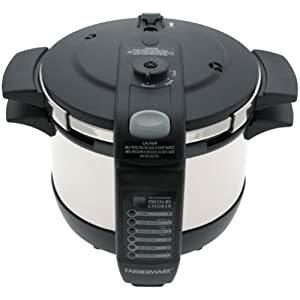 This farberware electric pressure cooker has definitely won many hearts as it has keeps the kitchen cool and clean by capturing the heat as well as the steam within the unit. It saves cleaning time as one meal is cooked in a single container. Apart from the comfort level, the advancement in the locking designs and the digital timing technology gives it an edge over the conventional stove-top models. Needless to say, it has also been successful in keeping the vitamins and minerals from escaping with the steam with its sealed locking lid.